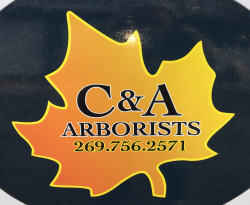 C & A Arborists, Inc.
C & A Arborists is the first tree service to be owned and operated by an ISA (International Society of Arboriculture) certified arborist in the Harbor Country Area. Our expert arborist, Christian Siewert, has been working in the tree service industry since 1987, and has been the owner of C&A Arborists since 1997. Christian studied arboriculture at Merristwood College in Guildford, England and received his certified arborist status from The International Society of Arboriculture after starting C & A Arborists in 1997. Christian and his team of trained arborists know the needs of trees and are trained and equipped to provide proper care. Continuing Education is very important to us. We attend several conferences and workshops each year to ensure we are current on updates and safe practices in the tree care industry. This includes continuing education, learning new pruning standards, research in pest and diagnostics, and safety and professionalism. Most conferences sponsor an exhibit featuring the latest and greatest tools, materials and services also. Email me jobs from C & A Arborists, Inc.